Again, for the fourth straight announcement, the Bank Of Canada has left the benchmark interest rate unchanged at 1.75%. The last rate change was in October 2018, which was the fifth time since the summer of 2017 that the BoC had decided to raise the rate. This was the first announcement that did not include any mention of a need for future increases, which signals that the BOC is in no hurry to move the rate (unlike past announcements where it was mentioned). The BOC is projecting growth of only 0.3% in the first quarter of 2019, with a slightly more positive projection on the second quarter. The BoC has eight fixed dates each year on which it announces whether or not it will change the policy interest rate. The announcement dates are January 9th, March 6th, April 24th, May 29, July 10, September 4th, October 30th, and December 4th. The Federal Government has announced the budget which includes a number of incentives targeted at housing affordability and helping first time buyers. The budget includes two main changes, with a number of details still unclear. The first incentive is the amount that an eligible first time buyer would be able to withdraw from their registered retirement savings plan (RRSP). The Home Buyers’ Plan will allow $35,000 (was previously $25,000) to be withdrew from the RRSP without having to pay tax on the withdrawal. The second incentive is the introduction if the First-Time Home Buyer Incentive which would allow eligible buyers to finance part of their downpayment through a shared-equity mortgage with CMHC. This would be for eligible first time buyers that are making a downpayment of less than 20 per cent. CMHC would offer 10 per cent shared equity mortgage for new construction homes and condos, or 5 per cent for existing (re-sale) homes and condos. It is expected to start in September and last for three years minimum. There are lot of details that are still unclear (shared equity? what about losses when properties sell? first time buyers - its not that simple! how much will they make when a buyer sells? etc.). Any questions on how it could affect you or an upcoming purchase? Fill out the form on the bottom of the page and let’s chat. 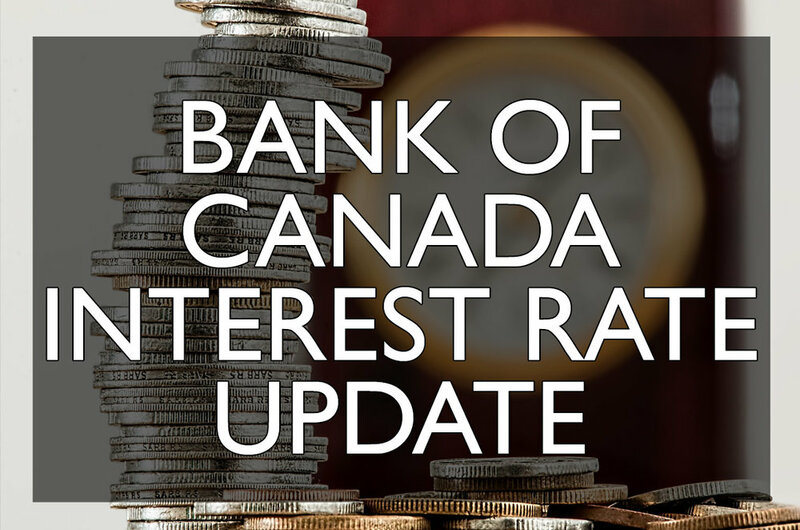 Once again, the Bank of Canada has just released today that it will keep its benchmark interest rate unchanged at 1.75%. The last rate change was in October 2018, which was the fifth time since the summer of 2017 that the BoC has decided to raise the rate. The BoC has eight fixed dates each year on which it announces whether or not it will change the policy interest rate. The next announcement will be on January 9th (followed by March 6th, April 24th, May 29, July 10, September 4th, October 30th, and December 4th). The Bank of Canada has revealed that it will keep its benchmark interest rate unchanged at 1.75%. This comes from the previous raise in October, which was the fifth time since the summer of 2017 that the BoC has decided to raise the rate.